The lone figure in Yoshitomo Nara’s White Night Cat menacingly peers through a deep red hole at the viewer with unknown intent. Typical of Nara’s style and themes, this pointy-eared character embodies another side to the Japanese “kawaii” phenomenon found in Japanese illustration and entertainment, utilized by Nara and his contemporaries. Unlike the imagery found in these sources, however, Nara subversively applies the phenomenon to a deeper exploration of the truth in a child’s ignorance. In the present lot, the white cat’s button nose is accompanied by sharp fangs and evil almond-shaped eyes, highlighting Nara’s fixation with the darker side of childhood innocence. The flat shapes and sharp contour lines of Nara’s iconic wide-eyed figures take their cue from popular Japanese anime traditions. In his paintings and drawings, the artist masterfully utilizes these elements to illustrate a central character often on a stark white background, as in the present lot. There is little context provided aside from the subtle facial expressions or minimal props that accompany the soft curves of the round faces and bodies. 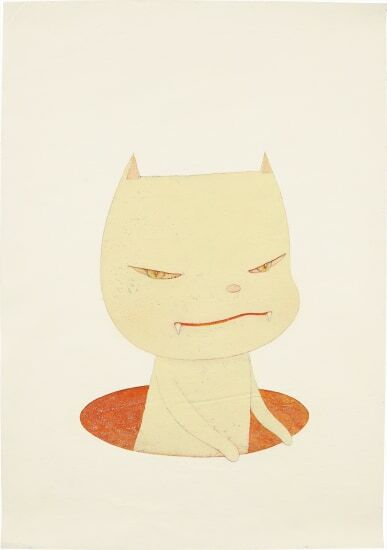 In White Night Cat, Nara builds up his image in textured layers of paint with obsessive rendering on paper. The subject’s white fur blends in with the creamy painted background on which it rests, making the only pops of color the cat’s facial features which portray a distinct, yet mysterious emotion. As such, the subject’s mischievous expression exemplifies Nara’s decades’ long exploration of childlike qualities that the artist himself seems intent on holding on to.